Equipment: Retrieve object, high jump, broad jump, cones (x4). Reinforcement: Two external reinforcers (food or toy), including one distraction reinforcer — handler may use external reinforcers to reward the dog’s behavior for up to two exercises. The reinforcer may NOT be kept on the handler’s body and must be located within the video testing area. In exercises where a visible distraction is required, then the distraction, when given to the dog, IS counted as one of the external reinforcers. The reinforcer MUST be the same food or toy that is used in any distraction work. One reinforcer = one food reward OR ball toss/toy play up to 10 seconds. Reinforcement may only be given in between exercises. 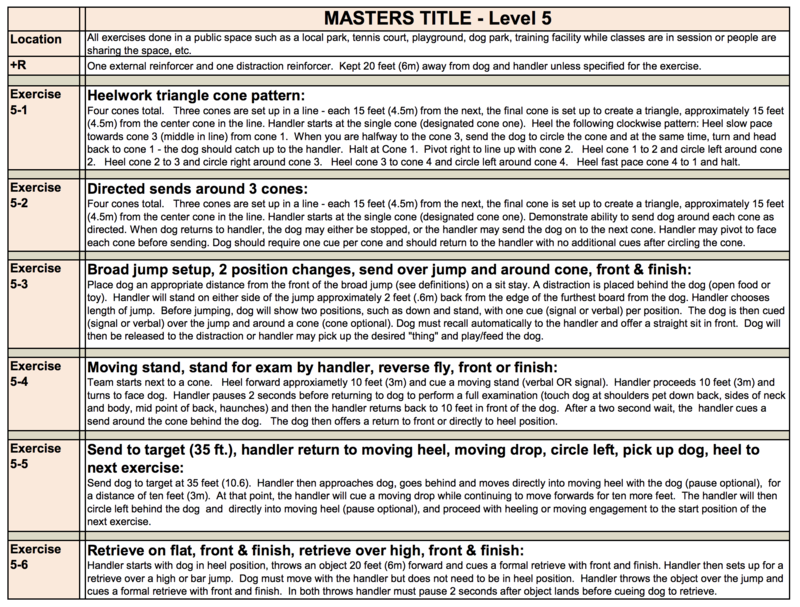 Note: Final exercise judged as questionable as handler did not wait the required pause times between throwing and taking the retrieve item on the retrieve over jump portion. 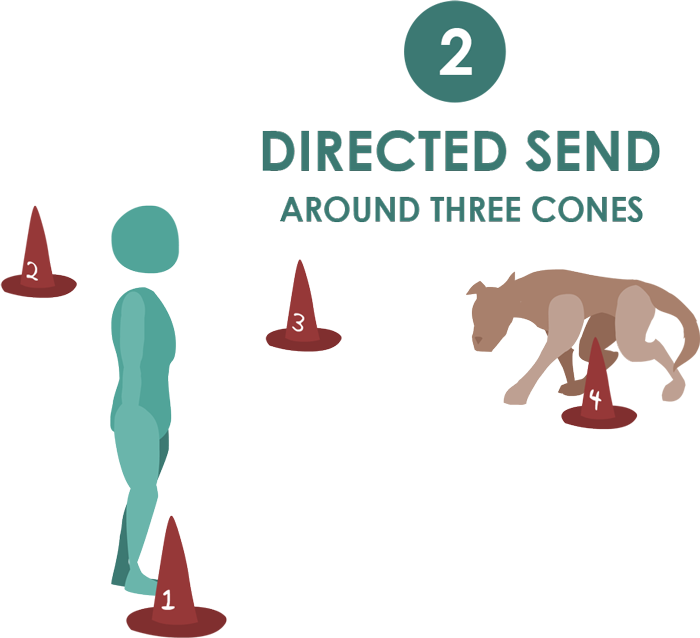 Send to a target at 35 ft. (10.6 m), return to moving heel, moving drop, circle left, pick up dog, heel to next exercise. After being sent to target, the dog will hold a stay while the handler returns and circles the dog. Team then heels forward, dog drops on cue, handler returns to the dog and team proceeds to the next exercise. 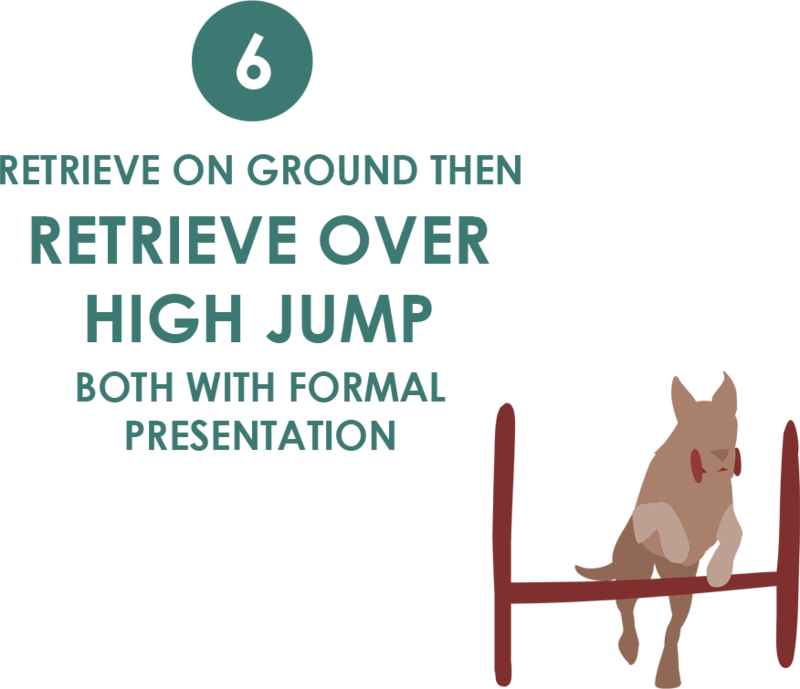 After cueing a retrieve on the ground, ending with a formal retrieve presentation, the team will perform a retrieve over the high/bar jump with a formal retrieve presentation.